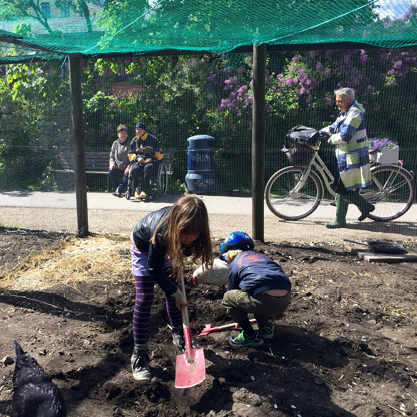 arki_lab has been involved in a research project into the field of intergenerational integration, funded by the Danish Ministry of Housing, Urban and Rural Affairs. The emerging demographic shift of an ageing population brings with it a new set of conditions that our built environment needs to respond to. Our specific challenge is to investigate new ways to plan and design public space that cater for users from different generations; spaces that encourage and facilitate cross-generational interaction and ultimately build bridges between these bifurcating groups. Our work so far has been to identify three different fields of study each representing a distinct urban condition: the city district, the suburb and the edge. For those who are familiar with Danish geography we have decided on Sydhavnen, Albertslund and Maribo. After this initial stage, we now need to plan ways that will gather the data we need to then design the various strategies and interventions. We have been reflecting on what exactly we want to know about each area, centred around finding out the residents’ perceptions of their neighbourhoods, the sites of social interaction between the generations, and the different community roles that people play. The key aspect for us to figure out is how to generate this information. How can we motivate people to take part and tell us about themselves and their community? Can this information gathering in fact also serve as an initial site of intergenerational interaction? One approach we have identified that will be particularly useful for areas we know least about uses the concept of probes. This involves sending something out to people that allows them to document information about their thoughts, movements and activities. By collecting the probes, we can then access the data and begin to build up a picture of the neighbourhood’s character. The traditional examples of probes are artefacts such as disposable cameras, maps or a diary/log book, but the arki_lab team is in the process of developing something a little bit different. The use of probes sits alongside our other, more familiar tools, such as prototyping, arki_nopoly and the CoCity App. These will be used to facilitate discussion between different groups and generate intergenerational interaction by way of co-designing an urban space. Our experience has been that engaging various people in a neighbourhood design project has a profound effect on building community ties as people realise they share a common interest in their local environment. Discussions continue over the details of the strategies and one particular topic of debate is whether we should be thinking in terms of analog or digital. Perhaps the ‘digital divide’ could be one way to bring different generations together? This is a year long project and we are still in the process of developing the initial steps to take. Keep an eye on the website for developments!